The end of July — eek! Only one more month to cram in any summer plans you haven’t gotten to yet. I’m going to have to work especially hard to squeeze out every ounce of fun from August this year: the big news in my life is that I’ll be having a baby this fall (! ), so this is my last childless summer to kick up my heels and go (alcohol-fee) crazy. Of course, summers for me usually mean spending a lot of time lounging on my back porch and generally being lazy. Maybe my plan should be to just chill and enjoy the quite and solitude while I can. + Cash + Gift Cards Don’t Have to be a Lame Present. One easy way to turn this “last-minute” present into a real gift. 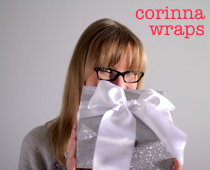 + Tissue Paper: Add a Whole New Layer to your Gift Wrapping. Think tissue paper is just for filling bags and boxes? There’s a whole world of tissue types and wrapping options. + Inaluxe’s Cheerful Australian Wrapping Paper. Vibrant birds and flowers from Down Under.